Written in Irish Issues: 09/16/13, 01:38:46 by jonathan | Print article | View all categories. As Minister of State with responsibility for Natural Resources it gives me great pleasure to address you today at this the inaugural All-Ireland Wildlife Crime Conference. Crime happens, it happens far too frequently, and it effect’s us all. Unfortunately wildlife crime also happens, it also happens far too frequently and one of my roles, and that of Inland Fisheries Ireland is to highlight how wildlife crime effects us all. There may have been a perception that wildlife or environmental crime does not really effect us, or more specifically effect me, the individual – so what if someone shoots a few deer or if a few grouse are shot out of season. Phrases like ‘only a few fish for the pot’ were unfortunately all too common in District Courts throughout the country when people were asked to justify their illegal fishing activities. However through the work of Inland Fisheries Ireland we have been able to demonstrate exactly what our fisheries resource is worth to the country, and by corollary how it could be impacted by illegal fishing. The figure is three quarters of a billion euro. Recreational angling is worth three quarters of a billion euro to the Irish economy and it sustains in the region of 10,000 jobs. 252,000 Irish people took part in angling last year and a further 100,000 visited from the UK, Europe, USA and further afield and 41,000 visited from Northern Ireland. I would like to give you a small bit of background about the fisheries service. Inland Fisheries Ireland was formed in 2010 following the amalgamation of the Central and seven Regional Fisheries Board and one of IFI’s key roles is the protection of wild fish populations not only in our 74,000km of rivers and 128,000 Hectacres of lakes, but also right around our 3,000+ Km of coastline and out to 12 nautical miles. Ireland is a beautiful, wonderful, country with a fantastic natural heritage and a diverse natural flora and fauna. It is, like many things, sometimes taken for granted. It is true that we have a much more urbanised population than any time in our history but what that means is that our wildlife and countryside is even more important as a recreational amenity, a national treasure. 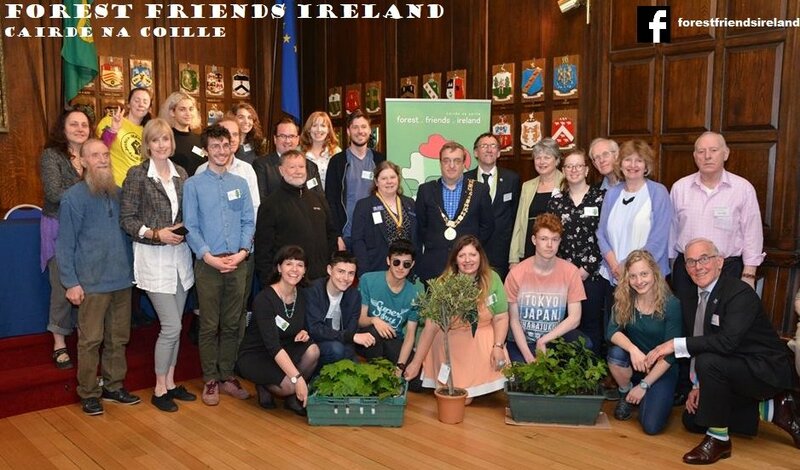 It is no accident that Ireland has an image of a clean, green environmentally friendly country, it is also no accident that this image is part of the package of measures used to attract millions of visitors to our shores and also to attract companies to invest in Ireland. So it should be no surprise to anyone that wildlife and environmental crime can negatively impact on this image of Ireland. What should be a surprise is exactly the potential magnitude of this impact. I am aware that the figures I have previously mentioned only referred to recreational angling, if the associated economic benefits of other countryside amenities were included, such as walking and cycling, the figure would be much higher. What is it worth to Ireland to have Golden Eagles in Killarney and Glenveagh National Park, both in terms of intrinsic ecological benefit, but also in term of the positive economic benefit of such species. Similarly one should ask what is the ecological and economic loss when a Red kite is found dead from poison? or native Irish Red Deer are illegally shot. Unfortunately the fisheries sector has another cross to bear and this relates to our past history when we had a landlord and peasant class (you might argue we still have it!! ), and it was acceptable, and possibly in some situations necessary, to poach fish from the private fishery. It was in many cases one up on the oppressor ….be that the landlord or the State. 98 is the number of prosecutions initiated last year for fisheries related offences. This figure represent the lower end of the activity spectrum as this is the number of people caught and where IFI had a strong case to bring to court. The number of illegal actions is of course much higher than that. 388 is the number of on the spot fines issued in lieu of prosecution during 2012, again this represents the number of people caught. What IFI doing about it, well IFI is bringing the fight to the poachers; 28,613 man hours were expended on lake patrols in 2012, 115,498 man hours were expended on river patrols and 17,253 man hours were expended on coastal and estuarine patrols in 2012. But staff are not just going out randomly on patrol and hoping for the best, they are using all manner and means of equipment to target specific areas and increase efficiency. For example Fisheries officers are now using bicycles to access areas quickly such as many river banks, kayaks are being used to conduct silent patrols along rivers and access areas which previously would have been almost impossible to get into unnoticed. Quad bikes are being used on some of the countries beaches to patrol for illegal bass fishing, Personal Water Crafts (Jetskis) and kayaks are being used to patrol shallow estuarine areas which previously would have been inaccessible to RIBS. Larger RIBS are being used to launch dawn patrols on coastal areas. Officers go well out to sea under the cover of darkness and then approach coastal areas at first light. It is not only the patrol methodologies which have changed IFI have a 24 hour hotline for reporting illegal activity and also the presence of invasive species (1890 34 74 24). They have also had significant success in the use of night vision scopes, thermal imaging equipment and covert cameras. Night time kayak patrols are now being conducted in pitch darkness with thermal imaging equipment along some of the countries largest river systems, and they have significantly aided in the detection of riverine nets. But arguably some of the best successes have come for the use of covert cameras. These cameras are covertly located overlooking a known poaching hotspot, the advantage is that they can use infrared light and operate in pitch darkness and they take an image of the subject and text it to the Fisheries Officer. So we now have a situation where the Fisheries Officer can actively patrol one area and remotely cover a number of other locations at the same time. This has led us to discover that in one area of the North West there were a number of separate gangs targeting one particular hotspot, each visiting the location on subsequent nights, or the individual caught netting a pool two nights on the trot. He was caught the first night, and of course thinking the Fisheries Officers would not be out again, he returned to the exact same spot to do the same thing the following night – refer back to my comment about living in the 19th century. IFI have also recently had their first operational success with its dog patrol unit. This is a pilot programme to train a dog to be able to sniff out nets and the location of stored fish. However with all of this innovation there are still people who just do not care. In 2012 IFI seized over 24.5Km of illegal net. Imagine that is the distance between the hotel here in Ashbourne and Grafton Street in Dublin in seized illegal nets. In 2013, 4.2km of illegal nets were seized in one District (Western River Basin District) in one month (July). So we still have along way to go. As Minister I am proud to be leading the team involved in the modernisation of the ‘Principal Act’, the 1959 Consolidated Fisheries Act. This piece of legislation underpins practically all of the key fisheries protection matters currently dealt with by IFI. However there is a small issue, it is 54 years old and it is a Consolidation Act. What this means is that it brings together all of the fisheries legislation from as far back as the 1840’s. So much of it unsurprisingly is of its time, and really reflects a different Ireland – end of the 19th century! So at the highest level one of the most important things I can do as Minister, to aid and assist in the protection of the fisheries resource, is to ensure that the all of the actions mentioned above are underpinned by modern, sound legislation. The ethos of this new Fisheries Act is to make it easy to ‘do the right thing’ provide for administrative sanctions for those who unintentionally do the wrong thing, and save all of the big guns for the people who knowingly go out there to commit a fisheries crime. The experience of IFI is that the majority of anglers want to go out fishing, have a reasonable prospect of catching a fish, have a good day and broadly stay within the law – so with this Act we must make it easy to do this. Unfortunately there is a ‘rump’ of people out there who for whatever reason, would take the last salmon from a river with a net, for their own purpose. These I would postulate, are the same kind of people who would shoot deer illegally or engage in other types of wildlife crime. I look forward to perhaps bringing a copy of the new Act to next years conference. Finally, I would like to conclude by thanking you for listening to me, and wish you a successful conference. The programme is an interesting one with speakers from National Parks and Wildlife service, An Garda Siochana, the Department of Agriculture amongst others whose presentations will outline the Governments commitment to tackling crime against wildlife. I also want you to know that I am take the issue of Wildlife and environmental crime extremely seriously and have been and will continue to work hard to esure it is given the priority it deserves.